Browse Hawthorn Suites Kingsland’s all-suite accommodations. Our suites mimic that of apartment living and offer you fully-equipped kitchens, spacious living areas, and access to our modern amenities to suit your busy lifestyle. Our hotel rooms in Kingsland, GA proudly offer you the largest accommodations in the area, with suites sprawling over 500 sq. ft.
Our thoughtfully-designed place to stay in Kingsland, GA bring you the perfect balance of comfort and convenience. Complementing our all-suite accommodations, enjoy our vast property full of amenities that are aimed at making your stay as comfortable as possible. Take a dip in our year-round outdoor pool, stay active in our onsite fitness center, and use our free Wi-Fi and business center to stay connected. 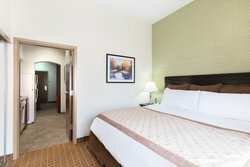 Make our hotel rooms in Kingsland, GA your home base as you explore Georgia or Jacksonville with ease, thanks to our great location just off the I-95. Planning a group booking? Submit a request for a quote here! With exceptionally large suites and kitchenettes, state-of-the-art amenities, and affordable prices, making us your extended stay hotel in Kingsland, GA is an easy choice. Check out our fantastic Kingsland hotel deals to see how you can score extra savings on your stay! At Hawthorn Suites Kingsland, each and every one of our expansive suites offers a kitchen with a fridge, oven, counter and storage space, a coffee and tea maker, microwave, stove, and more. Don’t feel like cooking? No problem. Wake up each morning to a delectable spread of hot and cold breakfast foods at the complimentary breakfast buffet at our top-rated place to stay in Kingsland, GA. Alternatively, enjoy a lighter start to your day with our 24/7 self-serve coffee in the lobby or grill your own selection of breakfast foods on our outdoor grills. Make us your place to stay in Kingsland, GA, and book today! Stay in our 1 King Bed Non-Smoking Suite with full-size appliances like a refrigerator, dishwasher, microwave, and a 2 burner cook-top. We also offer small appliances like a toaster, coffee maker, and pots and pans, with utensils and silverware and a stunning granite countertop. The bathroom has a granite countertop, full-size mirror, hair dryer and wall mounted vanity mirror. The bedroom has a separate door from other areas, so it can be closed for privacy or degrees of separation. 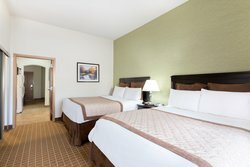 Our hotel rooms in Kingsland, GA proudly offer you the largest accommodations in the area, with suites sprawling over 500 sq. ft. Relax in our 2 Queen Beds Non-Smoking Suite with free hot breakfast, free Wi-Fi, a spacious living room, and a sofa bed. The kitchen consists of full-size appliances like a refrigerator, dishwasher, microwave, and a 2 burner cook-top. We also offer small appliances like a toaster, coffee maker and pots and pans with utensils and silverware, along with a stunning granite countertop. The bathroom has a granite countertop, full-size mirror, hair dryer, and wall-mounted vanity mirror. The bedroom has a separate door from other areas, so it can be closed for privacy or degrees of separation. 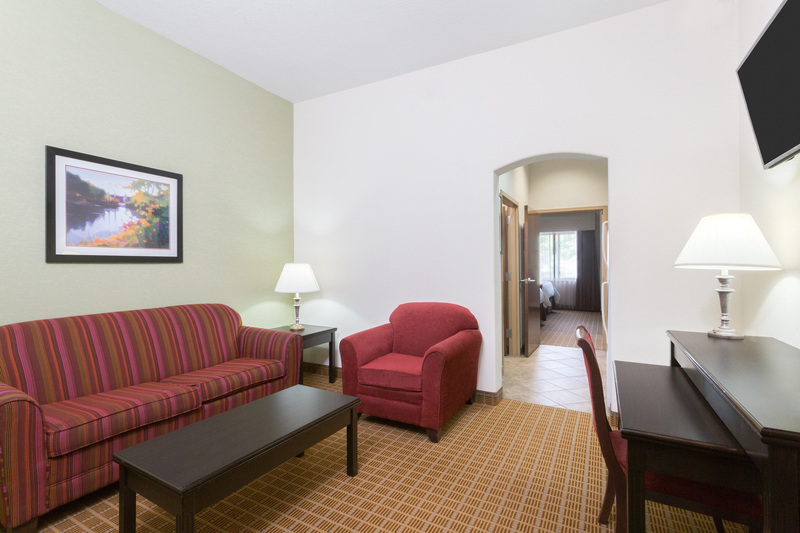 Book your stay in this spacious hotel room in Kingsland, GA today! 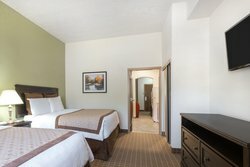 Relax in our 2 Queen Beds Non-Smoking Suite with free hot breakfast, free Wi-Fi, a spaciouslivinhg room, and a sofa bed. Browse Hawthorn Suites Kingsland’s all-suites accommodations. Our suites mimic that of apartment living and offer you fully-equipped kitchens, spacious living areas, and access to our modern amenities to suit your busy lifestyle. 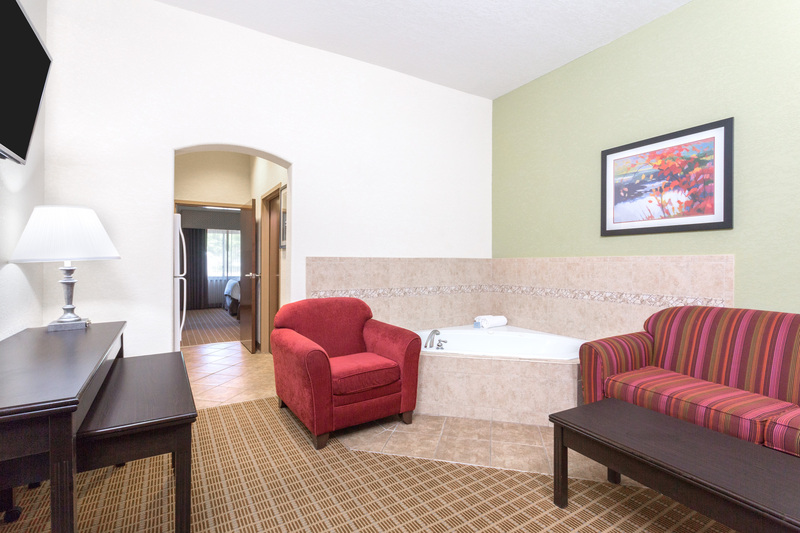 Stay in our 1 King Bed Hot Tub Suite with free breakfast and a luxurious hot tub. The kitchen consists of full-size appliances like a refrigerator, dishwasher, microwave, and 2 burner cook-top. We also offer small appliances like a toaster, coffee maker, and pots and pans with utensils and silverware, along with a stunning granite countertop. The bathroom has a granite countertop, full-size mirror, hair dryer, and a wall-mounted vanity mirror. Our thoughtfully-designed places to stay in Kingsland, GA bring you the perfect balance of comfort and convenience. With exceptionally large suites and kitchenettes, state-of-the-art amenities, and affordable prices, making us your extended stay hotel in Kingsland, GA is an easy choice. Upgrade your stay to enjoy the elevated comfort in our 2 Queen Beds Non-Smoking Suite with free hot breakfast, free Wi-Fi, hot tub, and a full kitchen. The kitchen consists of full-size appliances like a refrigerator, dishwasher, microwave, 2 burner cook-top, small appliances like a toaster, coffee maker and pots and pans with utensils and silverware with a stunning granite countertop. The bathroom has a granite countertop, full-size mirror, hair dryer and wall mounted vanity mirror. 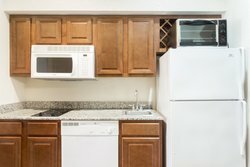 This suite is ideal for extended-stay guests and families looking for places to stay in Kingsland, GA.
At Hawthorn Suites Kingsland, each and every one of our expansive suites offers a kitchen with a fridge, oven, counter and storage space, a coffee and tea maker, microwave, stove, and more. Stay in our accessible 1 King Bed Non-Smoking Suite with a roll-in shower, raised toilet, and free breakfast. The kitchen consists of full-size appliances like a refrigerator, dishwasher, microwave, 2 burner cook-top, small appliances like a toaster, coffee maker and pots and pans with utensils and silverware with a stunning granite countertop. The bathroom has a granite countertop, full-size mirror, hair dryer and wall mounted vanity mirror. There’s space for everyone in your group to enjoy a comfortable rest in our 2 Queen Beds Accessible Suite. The accessible washroom has a roll-in shower, raised toilet, granite countertop, and space to navigate with ease. Sleep soundly in the bedroom with 2 queen beds that has a separate door to be closed for privacy. The suite’s private kitchen has a granite countertop, full-size appliances like a refrigerator, dishwasher, microwave, 2 burner cook-top, and small appliances like a toaster, coffee maker, pots, and dishware.